The Murdoch empire, as I’ve noted twice recently, has been not just showing its usual partiality towards the Tories, but has gone beyond mere approval to cheerleading. And there is, with Rupe and his troops, always a quid pro quo: this fawning coverage will not be provided free of charge. It is looking more likely that Murdoch will once again try to gain control of the 61% of Sky that he does not own. And then there is the BBC. The Corporation irks Creepy Uncle Rupe by its very presence: the funding model, via a license fee, is anathema to him. Its news and current affairs coverage stands, despite the accusations of bias (mainly from the right), as the gold standard others seek to emulate. Its family entertainment still garners large audiences. And its drama productions far outshine Sky’s Stateside imports and put its home grown content to shame. 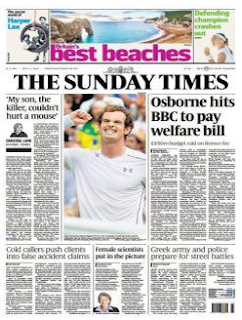 So today we saw part of that quid pro quo, as demonstrated on the front page of Rupe’s own Sunday Times. “Osborne hits BBC to pay welfare bill” span the headline, suggesting that there was some altruistic motive for shifting responsibility for free licences for over-75s onto the Corporation, rather than it being a down payment on what the Tories now owe the Dirty Digger. 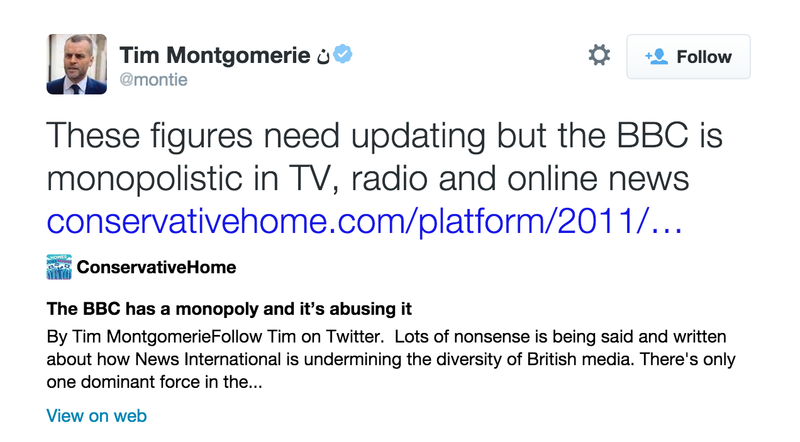 Moreover, there appeared to be more BBC bashing to come. 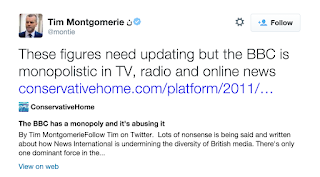 We can ascertain this from the interventions today from the serially clueless yet totally loyal Murdoch servant Tim Montgomerie, who has been dutifully denouncing the hated Beeb. Showing his agreement with the Rt Hon Gideon George Oliver Osborne, heir to the seventeenth Baronet, he told “Osborne absolutely right about BBC website. It's an unfair competitor to all other journalism that doesn't have licence fee subsidy”. 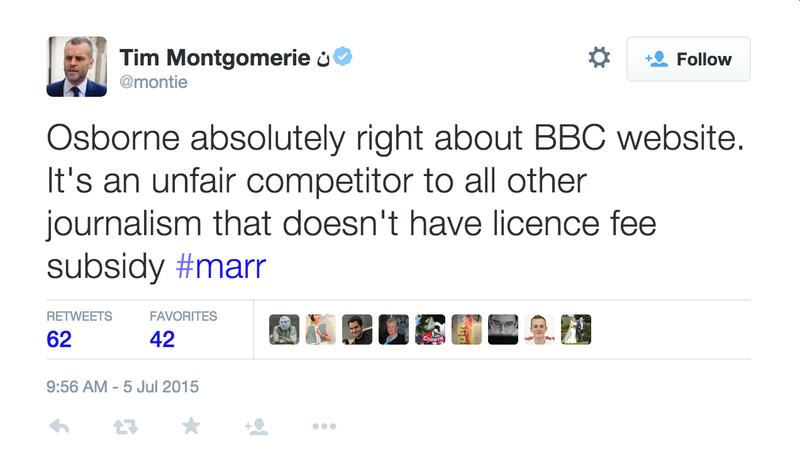 The licence fee, as any fule kno, is not a subsidy. Note also the key word “unfair”, a favourite of the so-called Taxpayers’ Alliance, used to demonise targets without having to resort to inconvenient things like facts. 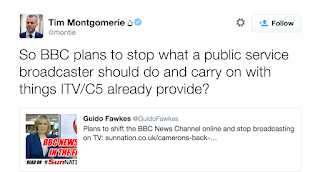 Monty also railed against HS2 - this fits with the Murdoch aversion to Government intervention - before having to resort to citing the Guido Fawkes blog in his desperation to keep on BBC bashing. “So BBC plans to stop what a public service broadcaster should do and carry on with things ITV/C5 already provide?” he gasped, the clear corollary being that this was A Very Bad Thing Indeed. So bad, in fact, that, as he told, “These figures need updating but the BBC is monopolistic in TV, radio and online news”. Clearly, not knowing the difference between “A large market share” and “monopoly” is not a bar to Times punditry. It also helps not to mention that Sky has a significantly bigger budget than the BBC. What it does help to mention is “Reports of the BBC being overstaffed have not been exaggerated”, where Monty fails to understand that registering for a conference does not have a one on one relationship with actually attending it. He provides no evidence that the Corporation is overstaffed. But his loyalty to Murdoch is unimpeachable. Expect more of this vacuous ignorance in the weeks and months to come. It was terribly leftie it had to go, go, go. The OzYank had a near miss last time he tried this kind of thing on. That rictus-grinning dope Jeremy Hunt was poised to hand everything over to him. Then the hacking scandal broke. Exit the Dirty Digger with egg on his ugly kipper. Then exit Hunt to run the NHS, where, of course, he's doing a bang-up job of readying health for privatised ambulances to search prone street casualties for credit cards. I think it's always worth remembering that what Murdoch managed with Sky was a con trick - getting people to pay for what they'd have got anyway. What you paid for was exclusivity - getting it before your neighbours did. Imagine a world without Sky. We'd still have had the digital explosion and 999 channels of whatever. We'd have top tier sports on terrestrial TV. It'd be the BBC or C4 buying up rights to HBO's finest, and we'd be enjoying Game of Thrones after Newsnight. If you subscribed to Sky in the early days, all you paid for was the exclusivity. The right to elbow other people out of the way, to watch that movie or football match a bit before everyone else. "Commenting on the likelihood of national newspapers moving purely online in the next decade, he (The chancellor) said: "You wouldn't want the BBC to crowd out national newspapers."" Hmm yes, the old 'BBC is killing off local journalism' story. And indeed, the BBC does run comprehensive online local news coverage. However, do you think for a moment that if it were to pull out, AP or whoever would step up to the plate and provide equally good service? No, of course not! 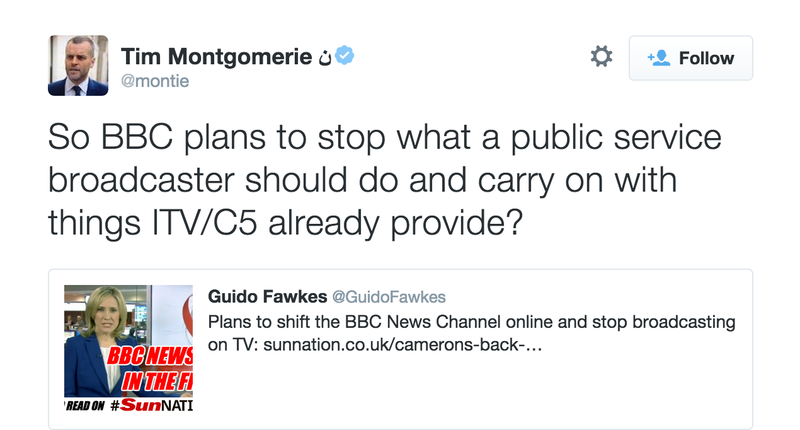 It'd be like asking commercial broadcasters to take over 6 Music, or Radio 3. 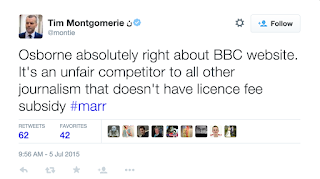 The BBC saw an opportunity and exploited it, and provided an absolute common good. Any commercial alternative would be absolute rubbish and likely top heavy with adverts/behind a paywall. Once again the collective whinge of the commercial media - "That's not fair! ".